To celebrate 700 likes on facebook I want to give this money pouch away. 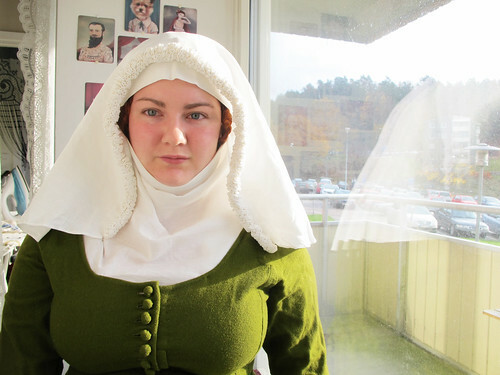 It is made after a Norwegian extant purse from late 13-th, early 14-th century. 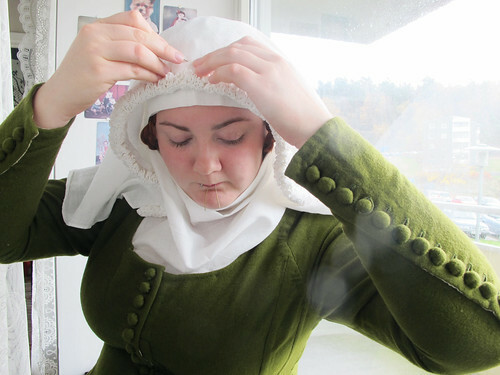 But this style is very common and fits both later and earlier periods. The pouch is about 7cm high. 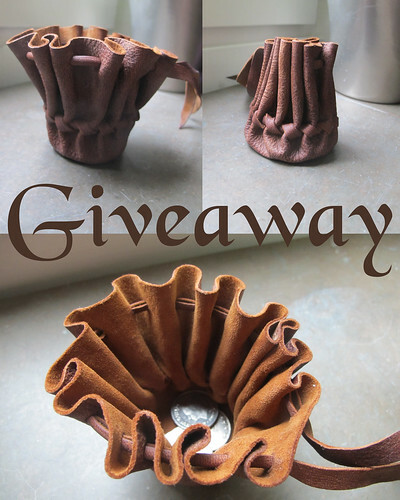 To join the giveaway you only have to go to my facebook page leave a comment below this picture. 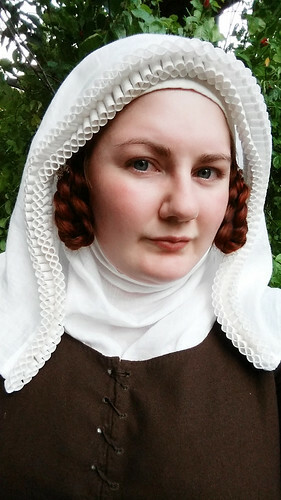 I will be starting to sell stuff for re-enactment soon, what kind of things would you be interested in purchasing from me? I will draw one name randomly next Sunday 17th of November at midnight. 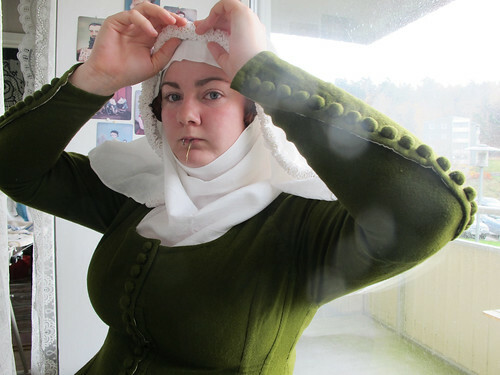 I thought thought that I would share with you how I put on my veil and wimple, my modern me have short hair, bangs and piercings, very non medieval of me. 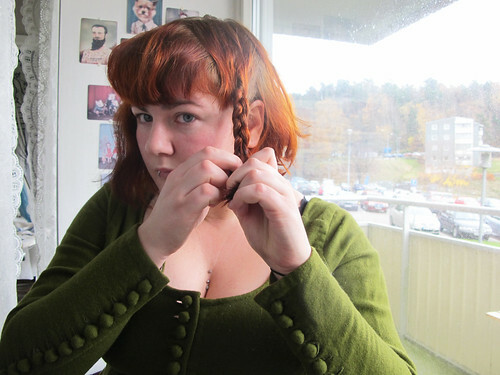 I start of by braiding the front part of my hair, I try to pull the braids forward a bit, that makes them look better later on. One braid on each side, at my temples. 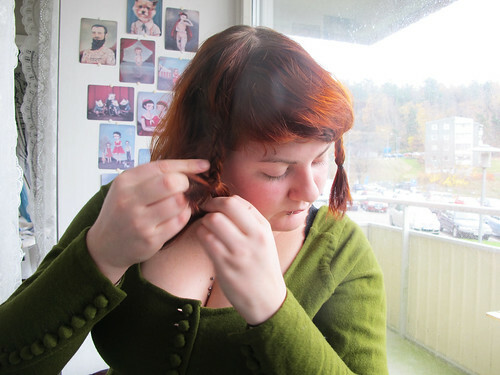 The last hair I pull back, as you can see there is not really that much hair, I wish I had long hair, but I am far to lazy to wait for it to grow out so I crop my hair every autumn, so in summer it is slightly longer than in these pictures. 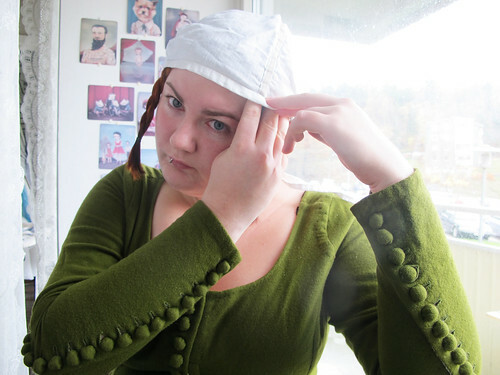 Then it is time for the St. Birgitta’s cap, this is the best thing ever as you use it to pin everything on. 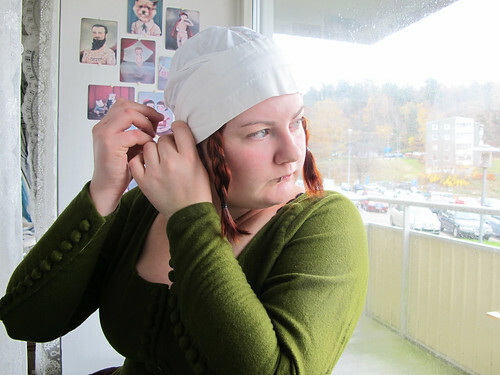 The St. Birgitta’s cap have long ties that you cross in the back. 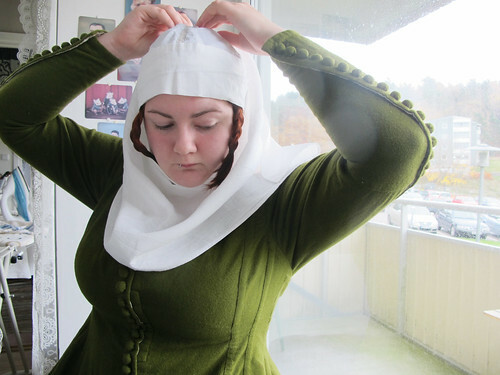 And then cross in the front and put over the back of your head. 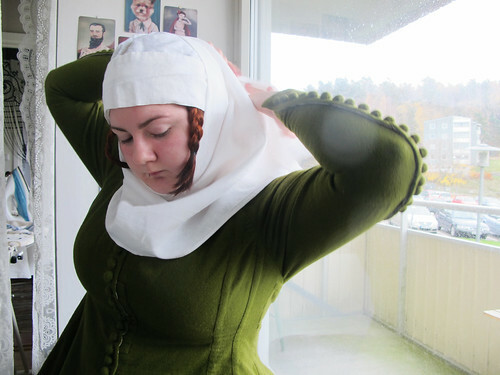 When I wear my St. Birgitta’s cap in the way that it sits best on my head, I feel that it sits to far back on the head to look good with my frilled veils. 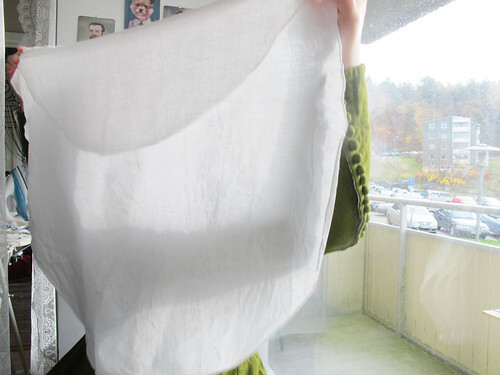 So I have finished of a piece of linen fabric with the dimensions 44*8 cm. 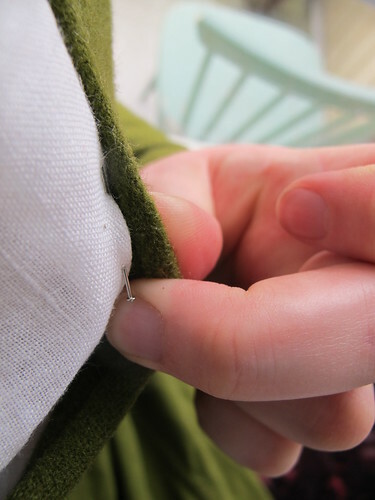 I make a small pleat in each end. Then I pin it to my cap. 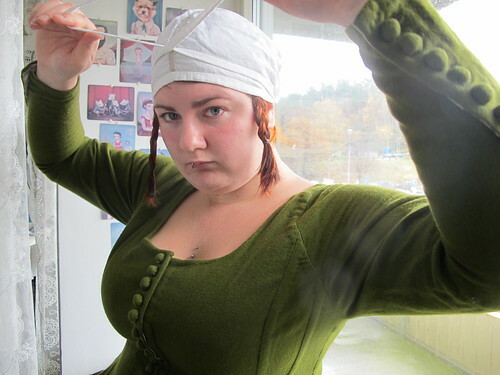 Here you see that I have pulled the braids to the front, this makes sure that they are visible when the wimple comes on. 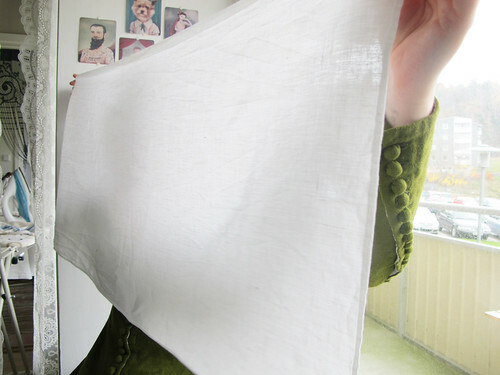 Then I take my wimple, it is 115*50 cm and is hemmed with a thin double folded hem. I put the wimple under my chin. 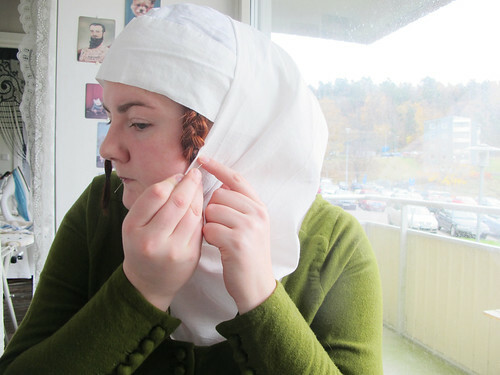 I pin it onto my St. Birgitta’s cap, not on top of my head but a bit to the back of my head and I pull it tightly around my chin. 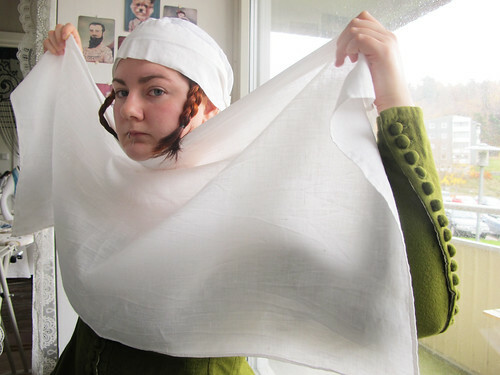 I usually have to make it tighter during the day as the linen stretches a bit with the moist and heat from my body. I fix the back so that it hangs nicely, I sometimes put a pin there especially when it is a windy day. 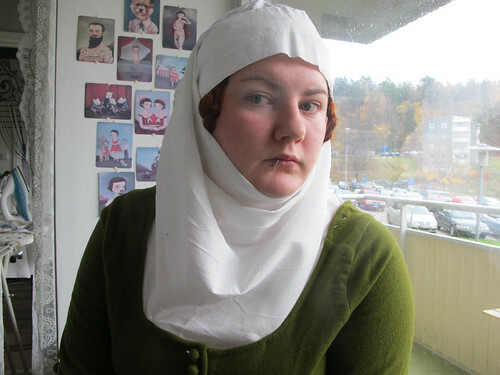 I put some pins in the neckline to, to keep it in place. I put them in like this. 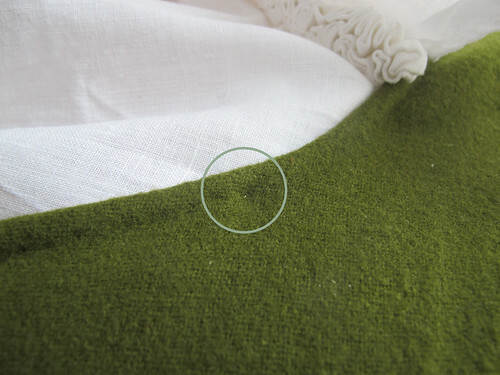 It makes the pins almost invisible, the only thing visible is a small dot and you can see in the circle. 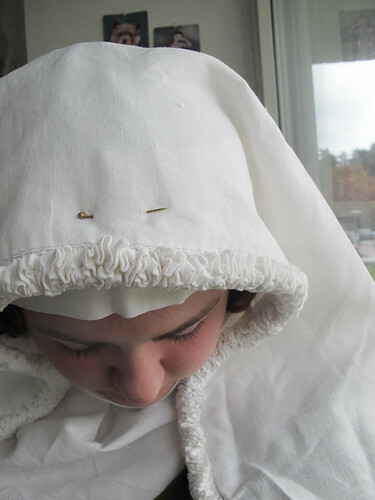 Then I put the braids inside the wimple and put a pin through the braid to keep it in place. Then I pull out the pretty pins. 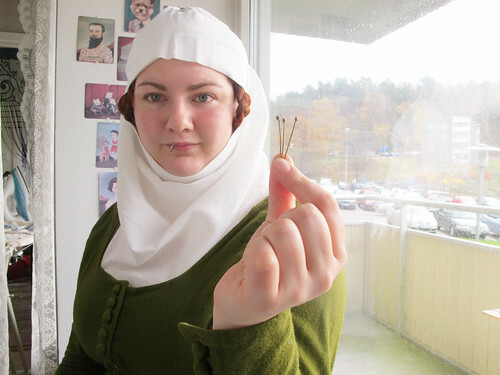 I always loose my pins that are in my wimple and neckline so there I use ordinary pins and they are never visible. But for the visible pins I use these nice ones from Medeltidsmode. 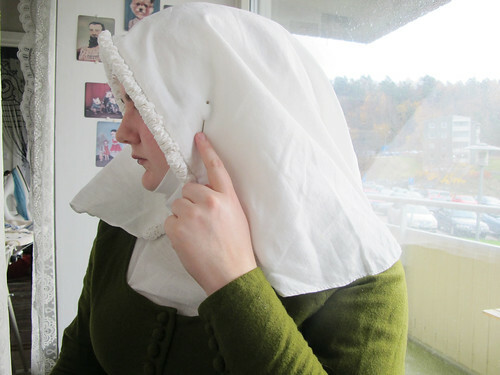 Then I take my veil, It is a full circle veil that is 91 cm in diameter, I folded in 25 cm and then I have attached my simple frilled veil to it. 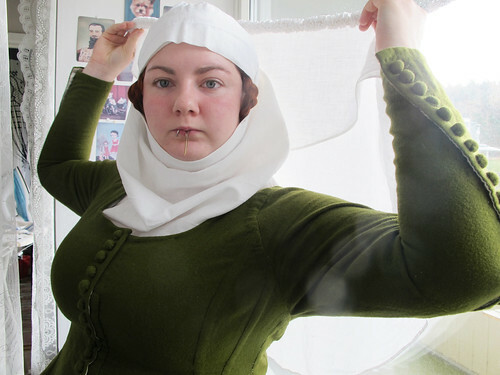 I put the veil on my head. Adjust it to sit nicely. 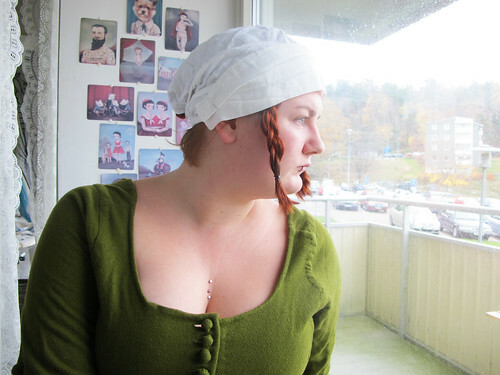 Then I put a pin on top of my head, making sure to catch all the layers including the St. Birgitta’s cap. 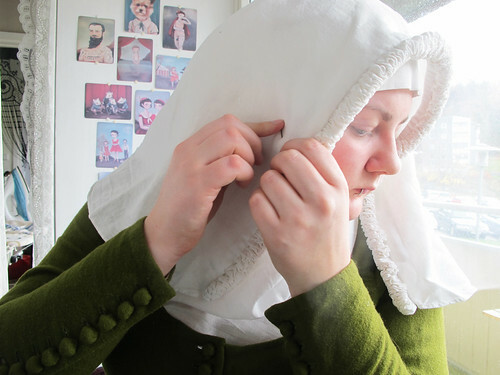 Then I pin the veil to the wimple. The pin on top of my head. 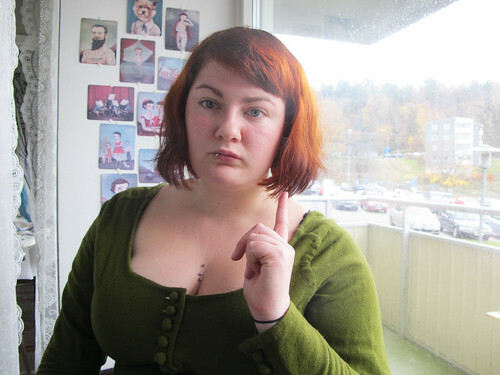 And that is it, I remove my lip piercing and the transformation is finished, now there is no bangs, no piercings visible and the short hair looks like trendy braids.